Basella. One of the amaranths. This is a tropical climbing plant which can grow up to 2 meters (6 ft) in height. 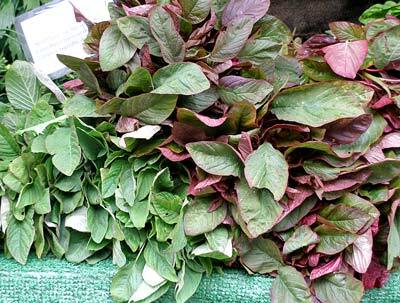 Basella rubra provides succulent red leaves and is otherwise known as Ceylon spinach or vine spinach. The leaves are harvested as the plant grows and cooked in the same way as spinach or in oil with spices.